egg salad is not, even in its traditional form, particularly attractive. or even appetizing, necessarily. there is a curried one they serve in finger sandwiches at a tea shop near my house that is quite nice, and i’m sure i’ve had others along the way that aren’t offensive, but by and large i think of egg salad as a squidgy, gloppy mess you might find in a sandwich at the bottom of your lunchbag, smushed and probably a little stinky. but this one’s different! i promise. first of all, it’s uglier. secondly, it’s mixed in to the brim with a bunch of beautiful-tasting things: sautéed mushrooms, caramelized onions, fresh dill, kicky dijon mustard, a squeeze of lemon. the play of flavors is so fun to eat. 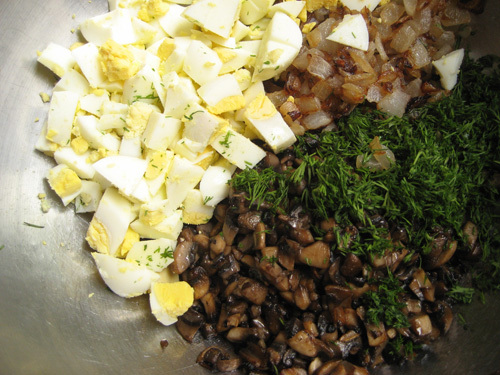 the textures of the mushrooms and the hard-boiled eggs mimic each other, there are soft pockets of sweetly browned onion bits, and the dill and lemon brighten everything up. piled on a soft slice of deep dark rye bread, or sandwiched between two, you’ve got the perfect one-handed meal. it’s just the thing to pack up for a springtime picnic, along with a jug of ice-cold sweet tea maybe, and a box of fried chicken. it’s also perfectly wonderful to eat while sitting barefoot on the porch, with a book in the other hand and soaking in the warm sunshine that has gleefully made its return. Heat 3 tablespoons of the oil in a 10” or 12” skillet over medium-high heat, and add the mushrooms. Cook, stirring often, until lightly browned, 14-16 minutes. Transfer to a large bowl, and set aside. Wipe out the skillet. Heat the remaining 2 tablespoons of oil in the skillet over medium-high heat, and add the onion. Cook, stirring often, until the onions begin to soften; then reduce the heat to low and continue to cook until lightly caramelized, 10-15 minutes. Transfer to the bowl with the mushrooms. Add the dill and eggs, and stir to mix. 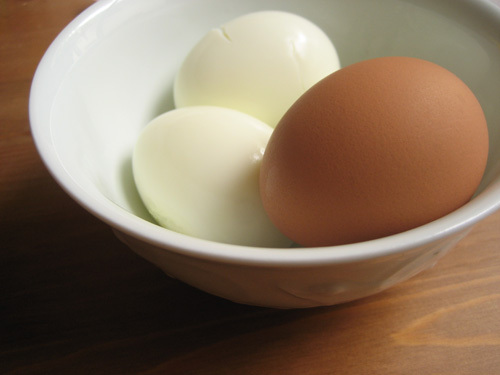 In a small bowl, whisk together the mayonnaise, mustard, and lemon juice. Add about half of the dressing to the mushroom mixture, and toss until evenly combined. Taste, and add more dressing as needed. Season with salt and pepper and more lemon juice, if desired. i don’t have much tolerance for pizzas that replace the crust with some non-crust material. english muffins, split and smattered with sauce and cheese and given a run through the toaster oven – they were fun as a kid. but a good yeast dough will bake up to be crispy, tender, and chewy in the oven – a perfect platform for whatever you decide to strew on top – and you really shouldn’t mess with it. there may come a time in life when you welcome a meal that can be toasty and tasty in five minutes flat. and so you realize you’ve got to swap out the yeast packets and floured hands and rising time for something a bit more efficient. when you’re ready to make such a compromise, back up from the english muffins; grab a package of flatbread instead. after a short time in a hot oven, each round gets browned and crisp around the edges and – with enough choice ingredients layered on top – you forget to be a snob about it and just bite, chew, and enjoy. i got to eat this gourmet-ish dinner nearly every evening this week thanks to a friend who, instead of showing up to dinner with a bottle of wine for the hostess, handed me a printout of this recipe. note: while getting all the ingredients from trader joe’s may not be wholly necessary, it sure adds to the whole “easy” part of it. also: you will end up with some extra prosciutto and cheese after you make the pizzas, but i’m sure you can find a way to “take care” of the leftovers. and: there will be sauce left too. that’s just annoying. i apologize. Preheat oven to 425 degrees. On one flatbread, thinly spread 1 ½ teaspoons of pizza sauce. Distribute one string cheese on pizza, crisscrossing shreds for even coverage. Tear half a slice of prosciutto into small bits and distribute on pizza, followed by small chunks of goat cheese and caramelized onions. Repeat process for each flatbread. Bake for 6 to 7 minutes (closer to 5 if using a toaster oven), until cheese is bubbly and lightly browned. *To make the balsamic caramelized onions: Melt a few tablespoons of butter (2 to 4 depending on the size of your onion) in a pan over high heat. Cut an onion in half, remove skin, and slice into half-moons. Throw onion slices into pan and let them brown over high heat, stirring or shaking the pan only occasionally. When the onions have gotten soft, brown, and caramelized (about 10 minutes), pour in a few glugs of balsamic vinegar (about 2 tablespoons, or to taste). Continue to cook over high heat, stirring constantly, until the vinegar has reduced and coats the onions (a few seconds more). Remove from heat.